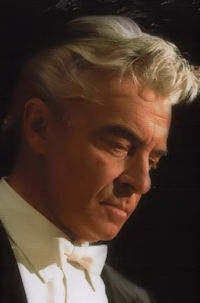 Herbert von Karajan’s 1961 Wiener Staatsoper production of Parsifal caused quite a stir, not only for his idiosyncratic stage directing and lighting, but for employing two sopranos in the role of Kundry. Elisabeth Höngen portrays the frenzied, haggard side of this character in Act 1, the opening scene of Act 2, and silently in Act 3 (except for two words). Christa Ludwig appears in Act 2’s long second scene as Kundry transforms into a beautiful temptress. She gingerly approaches the notorious leaping interval pinpointing Kundry’s mocking of Christ, yet is otherwise in excellent voice, though not as deeply into her part as she is in the 1972 studio Parsifal under Solti (see note below). Fritz Uhl is strong in the title role, while Walter Berry brings sonorous malevolence to Klingsor, and Waechter and Franc respectively sing Amfortas and Titurel with both conviction and beauty. Best of all is Hans Hotter, arguably the 20th century’s greatest Gurnemanz. He sustains this lengthy role through his care with words, his unerring sense for interior drama, and his strong vocal presence. While BMG’s remastering improves on previously issued pirate versions, the overall mono engineering is strident and claustrophobic, sounding much like those early 1940s Wagner broadcasts recorded by German radio on experimental tape stock. You’ll get a better idea of Karajan’s blended delicacy via his 1980 Deutsche Grammophon studio Parsifal, albeit with less distinct vocalism. And Hotter sings just as well in his live commercial version from Bayreuth (1962) with Knappertsbusch in the pit. Good annotations are included, but no texts. The first part of act 1 is missing (until “Fort, fort – ins Bad!”) and has been replaced from a different performance. This is so with all releases. The Gurnemanz is (probably) Jerome Hines.